January is Costume A-D-D time. A whole new year lies ahead and we are all brimming with project ideas. Some I've even started and have abandoned for the time being as the new shiny ideas and events crop up. 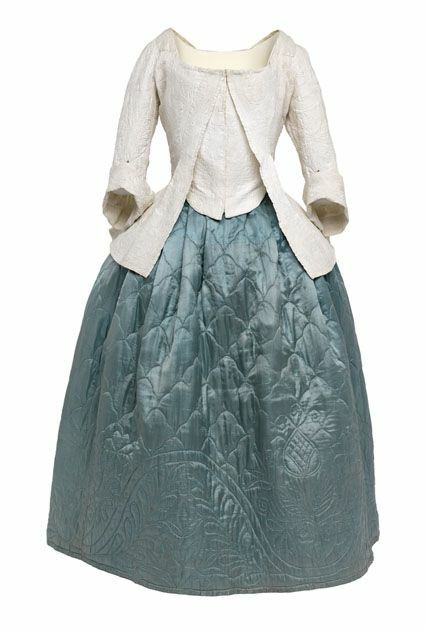 Latest on my *grabby-hands* list is this amazing 1780-1781 Scottish jacket. 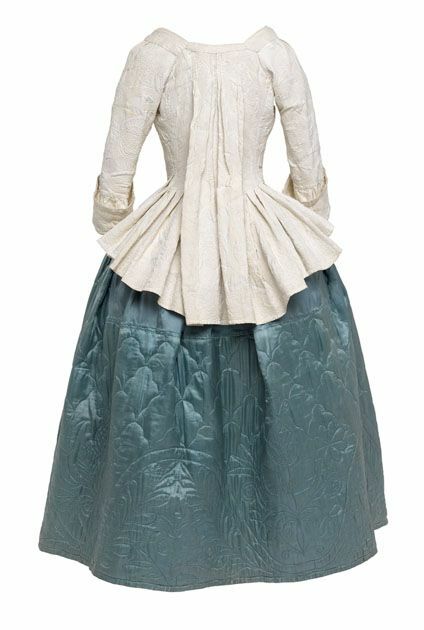 What I love about this piece is that it is a bit weird: it is made like a polonaise in the front with loose open edges and a false waistcoat...but it has a sacque back. The jacket is made from hand-corded linen, lined in linen. 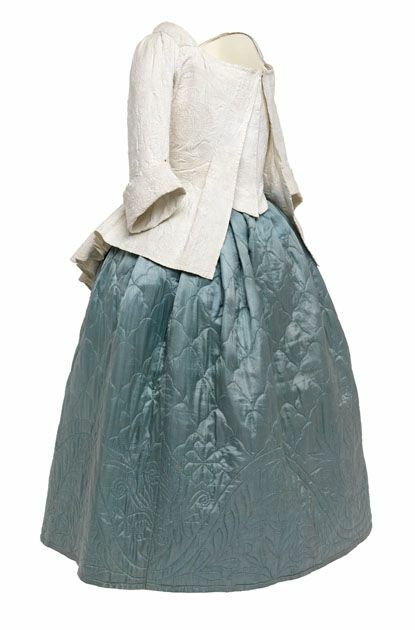 It was worn by Mary McDowall, the wife of George Houston of Johnstone Castle in Renfrewshire, Scotland, and is currently held in the Glasgow Museums Collection. Luckily for me, Abby and Brooke Welborn studied this gown and took excellent photos. I can't share these photos, unfortunately, but they've already helped immensely in understanding the quirks of this jacket. My drawings and notes trying to work out how this jacket was made. 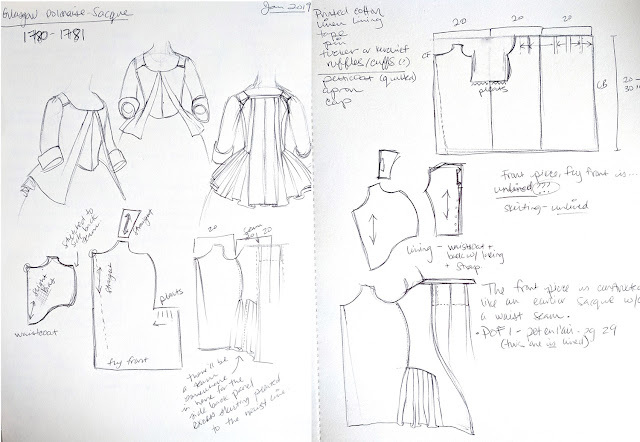 I saw Brooke's photos after these sketches so now know there is a tuck in the front piece near the side back seam that helps shape the front of the bodice, typical of polonaise construction. For instance, the skirts are cut and pleated peculiarly from the side seam to back underneath the sacque pleats, rather more like an English gown than a sacque. The cuffs are put on very interestingly, and the bodice fronts are shaped entirely by tucks. Some things I expect and understand and others make me scratch my head a little. It's the "wait, but why" that always intrigues me most, and the part I most enjoy, though. Once again, proof that stitchers did just about everything! Every time I hear or read, "That was not done," pretty soon I see that very thing. Love this jacket! It may have been worn riding - we can't know for certain. The petticoat likely belonged to the same woman but it's conjecture whether these two garments were worn together or not. I don't know all the lingo of historical costumers, which I've followed for about 2 years. What is Costume A-D-D time? Is it something to do with Costume College? Haha, sorry! Costume Attention Deficit Disorder - or basically, when you are inspired with so many costuming ideas that you can't stick to just one. I knew this dress looked familiar - I saw it at the Kelvingrove museum in Glasgow this summer. Oh gosh, I would love a pattern for this. Lovely jacket, thanks so much for your deconstruction. I'm excited to see yours made up!